Listen for Love on 98.7! 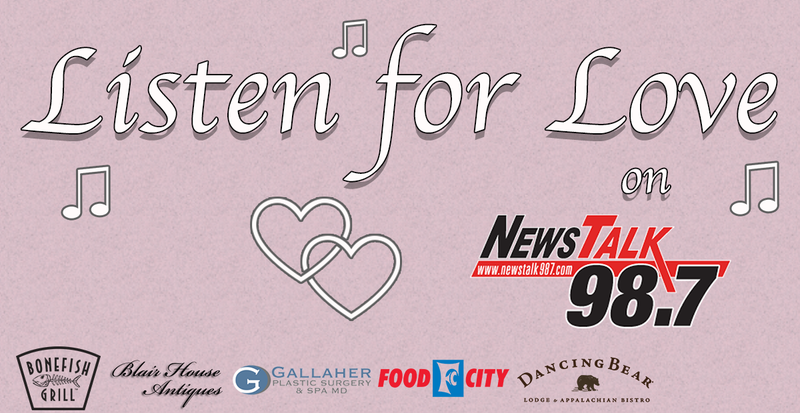 Listen for love on NewsTalk 98.7! Tune in for your chance to win a huge Valentine’s Day prize! Starting February 4th, listen to News Talk 98.7’s Phil Williams (6:00 am – 10:00 am) and Bob Yarbrough (10:00 am – 12 noon) who will play a LOVE SONG each day ONCE during their show to encourage listeners to listen to Hallerin Hill (3:00 pm – 7:00 pm) each afternoon for that days LOVE SONG to play. The 5th caller to call in once that song is played will receive a qualifying prize, and will be qualified to win the Grand Prize package! Gallaher Plastic Surgery & Spa M.D.